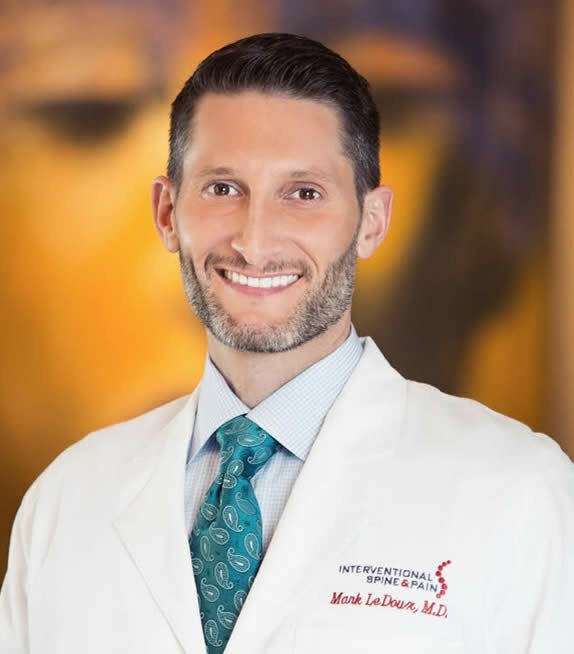 Mark A. LeDoux, M.D., P.A. ONLINE OPTIONS: Dr. LeDoux is accepting new patient appointments, current patient appointments, clinic and procedure scheduling, and questions. If you would like to reach out to Dr. Ledoux online to schedule an appointment, use Dr. Ledoux's online form below. THIS FORM IS A CONVENIENCE AND IS NOT TO BE USED FOR URGENT MATTERS. WE HAVE THE RIGHT TO NOT RESPOND TO REQUESTS BASED ON THE CIRCUMSTANCES OF YOUR REQUEST. ALWAYS CONTACT OUR OFFICE DIRECTLY OR DIAL 911 IN THE CASE OF AN EMERGENCY. Dr. Mark LeDoux is awarded as a Texas Rising Star by Super Doctors seen in Texas Monthly third year in a row. By strict selection process he is listed as one of the states top providers in his field. He expresses great honor and gratitude for being selected for this award. Dr. LeDoux was born in Lake Charles, LA, and raised in Port Neches, TX. He earned a Bachelor of Science degree from Lamar University where he was an internationally ranked 400m hurdler. He continued on and graduated from medical school from the University of Texas Health Science Center in San Antonio in 2004. After medical school, Dr. LeDoux completed his Surgery Internship in Houston at Christus St. Joseph’s. His Anesthesiology training was then completed in 2008, at the University of Texas Southwestern in Dallas. There, he also completed an American Board of Anesthesiology accredited Fellowship in Interventional Pain management. He is board certified in Anesthesiology as well as Pain Management by the American Board of Anesthesiology. Beyond delivering the highest level of technical care, Dr. LeDoux is committed to providing a compassionate and comprehensive approach for his patients. His goal is to restore functionality in their everyday schedule as well as overall quality of life. Medtronic Pain Theory and Technique Workshop, Baltimore, MD, August 2009. Ziconotide’s Efficacy In the Treatment of Neuropathic Pain, Case Reports and Discussion by Brian Bruel, M.D., Assistant Professor UTSW Pain Management, Mark LeDoux, M.D., Clement Yeh, M.D . Accepted for review by Spine Journal, November 2009. Opioid Induced Hyperalgesia-UTSW Pain Management Journal Club, November 2008. Vertebral Compression Fractures-Pain Management Grande Rounds, UTSW, September 25, 2008. Chronic Pain Syndromes-Vapor Camp, Review course for incoming Anesthesiology residents at UTSW, September 7, 2008. Radiofrequency Procedures-Dallas VA Medical Center Pain Management Grande Rounds, August 21, 2008. Local Anesthetic Toxicity, Diagnosis and Management-Lecture to Parkland Operating Room Recovery Nursing Staff, November 16, 2007. Inotropes, Lecture on Pharmacology and Perioperative Uses, UTSW Cardiac Anesthesiology Grande Rounds, October 17, 2007. Acute Myocardial Infarction-Diagnosis and Management-Dallas VA Critical Care Grande Rounds, September 21, 2007. Intercostal and Interpleural Nerve blocks-Pain Management Grande Rounds, UT- Health Science Center San Antonio, January 22, 2007. Today’s Superbug: Methicilin-resistant Staph aureus, Christus St. Joseph’s Department of General Surgery Grande Rounds, Houston, TX, October 6 ,2004. The New England Journal of Medicine, "C-Reactive Protein may be a Marker of Susceptibility to the Seroton Syndrome: a First Report", letter to the editor by Mark LeDoux, MS4; Kenneth Braslow, Resident in Psychiatry, & Thomas M. Brown, Assistant Professor, Department of Psychiatry, University of Texas Health Science Center San Antonio. If you would like to reach out to Dr. Ledoux online to schedule an appointment, use Dr. Ledoux's online form below. NOTICE: THIS FORM IS A CONVENIENCE AND IS NOT TO BE USED FOR URGENT MATTERS. WE HAVE THE RIGHT TO NOT RESPOND TO REQUESTS BASED ON THE CIRCUMSTANCES OF YOUR REQUEST. ALWAYS CONTACT OUR OFFICE DIRECTLY OR DIAL 911 IN THE CASE OF AN EMERGENCY. "I have been a patient for dr. ledoux for about 3 years now and after this last visit i felt the need to leave a review. I was unable to afford my visit due personal reasons along with finances due to my current divorce. My visit in total would have been 140.00 . After speaking with his MA Sierra she and Dr ledoux saw me at no charge and were very understanding to my situation. Mind you i had just visited with my GI doctor who could not seem to put himself in my shoes and show compassion. Know that your small act of kindness made my week a little brighter." "I had my first visit with Dr. LeDoux on last week. He is unlike most doctors that I have met. Very kind and down to earth. He treated me like a person and took time to really figure out what was going on with me. I was a little optimistic about seeing a pain doctor as I've heard most just like to drug you up. However he made the visit fairly easy. I would recommend him highly, and I am kind of sad my next visit isn't until 3 months from now." "My first visit with Dr LeDoux was a quite interesting. I got lost initially but his staff was very patient in giving me directions. When i arrived i was brought into the exam room promptly. His nurse was a young woman who has actually dealt with my reason for visiting so she made it a lot easier and personable for me. She was very polite and held my hand through the process. Dr LeDoux was nothing as i expected. He was a young guy with a very pleasant attitude. He took time to educate me on my diagnosis and explained my Cat scan results as the doctor who recommended me to him had not. Not your typical office staff very young but the environment was calm. Office very clean. The only unpleasant experience i had in the office was a scheduler who seemed to be too busy to set my next appointment due to her own personal phone call. Now that i have driven to the location i should make it to future appointments on time and learn more about my condition. Bedside manner impeccable." "Dr. LeDoux is an excellent doctor who is compassionate, a good listener for the most part and is one doctor that I feel attempts to help me feel better from my pain." "Its been a long time coming with my treatment for CRPS and Dr. Ledoux is the 5th specialist that ive visited with. He is also the ONLY one to actually appropriately treat my diagnosis. The only downfall was my wait time, however He spent a lot of time with me and was very personable. Hes such a sweetheart. Very precise"